Evenflo is dedicated to building its tradition as a trusted partner in nurturing children. We are committed to providing quality baby products for children and those who care for them. Shop our complete line of infant and toddler car seats, baby gates, breast pumps and more. 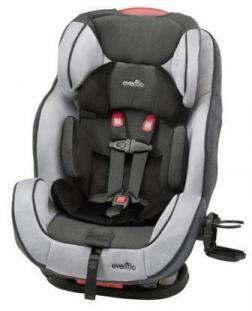 The Symphony 65 LX All-in-One Car Seat is a unique car seat that adapts to the changing needs of a growing child providing an simple, innovative and stylish way to keep them safe, secure and comfortable.Try this toddler car seat for an excellent extended-use option at an affordable price. Top of child's head is at least 1 inch (25 mm) below the top of the child restraint seat back. The tops of their ears are below the top of the child restraint headrest.